In some ways, it feels like it was centuries ago when I started researching what was to become the book, Between Worlds. Like its heroine, I too was pulled over to The Green; that mystical, often magical, frequently haunting place known as Ireland. It is truly a land of layers, of stories, of polarities, and of love. Ireland is a door to the heart. After years walking its pathways, I’m convinced of that. But like any magnificent door, it requires a key, and finding the key to the heart of Ireland becomes a journey in itself. There is a saying that some places make you pay your dues. For me, Ireland was one of them. Of course once you do, there is no end to what they might tell you. And once you do, they never quite let you go. Birthing Between Worlds, finally, is for me a give-back. 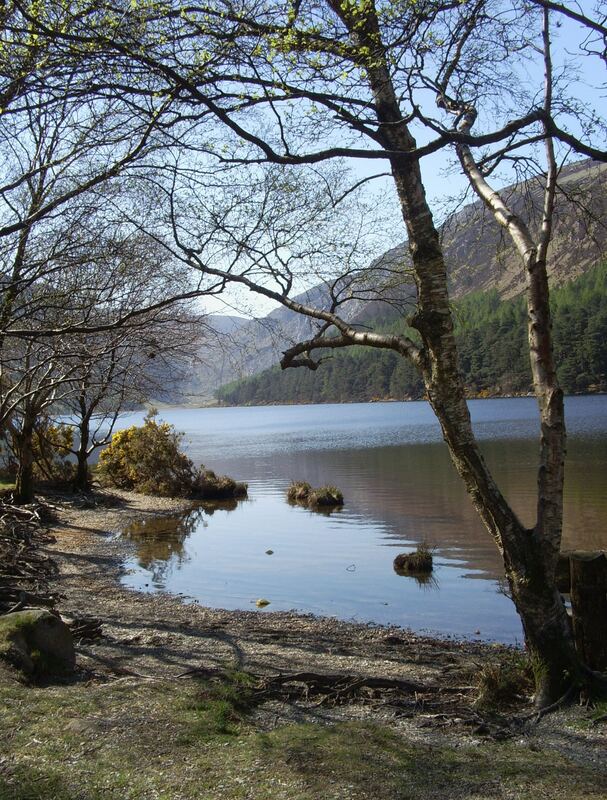 It is a story that so deeply wanted to be told that it yanked me clear across the Atlantic to follow its trail, plunked me at the edge of Glendalough, and demanded that I listen. Had I known the journey it would take me on, perhaps I would never have gone. But that’s the force of such things, isn’t it. To tempt and tantalize, envelop and immerse you to such a degree that you find yourself heading off a proverbial cliff with no idea of the outcome or even the steps along the way. For me, it has been a story worth telling, something that has been hidden within the mists for far too long. Ultimately it is a story of the heart. After all, it’s from ancient Ireland. How could it not be? And, it’s a self-published book searching for its audience. Perhaps you are one of those people meant to wander through its pages and be touched by the magic of its story. 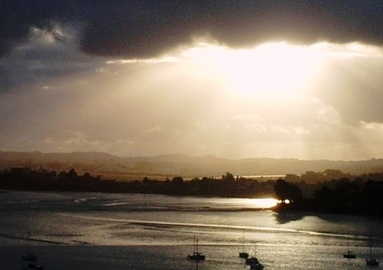 LAND OF THE LONG WHITE CLOUD – AOTEAROA – Where stories linger like slender strings of tiny ocean pearls within your billowy sleeves of cloud-like memory. Where sky and sea walk hand in hand and in their mirage-like midst worlds both old and new appear to hover, and on their very edges ethereal doors stand ready to be entered, to share gifts perhaps waiting to be given. Is it but a dream to feel this way? And yet somehow, I think not. Aloha, I answer. For that is what I know in my heart. Heart – the door you offer, at least to me – the chance to enter a land of ancient openness and be at peace, to walk with ease again along the corridors of time. As if a jewel had been here patiently waiting to be retrieved and lived anew. Strange to find you now, for I have landed on your shores when the earth is rumbling mightily and the ring of shifting sands and olden fissures is making itself known. Breaking through the seeming solidness of life and coughing up its innards for the entire world to see. Kia Kaha, you say, for you have been through this before and know no fear. Is that the opportunity, when all else falls away, to know no fear? To know that life always begins anew, that if we open our hearts and trust the birth, it can perhaps be even better than before, that we are strong in spirit no matter what? I am touched by the hearts of people on this land of yours, Oh Long White Cloud. Touched by their generosity and kindness in the midst of devastation – their willingness to reach out and help another. It is the humaneness within humanity, is it not – to offer aid without question or condition? Too often we forget this as we stride our world of ever-increasing gadgets and sound bites. Your people are helping us to remember. Ke Aloha Aotearoa, your beauty is astounding. Gods have walked upon your earth and fished in your waters. Songs have been sung in your honour and winds have dashed your shores. Mountains high and long have risen dressed in snowy garments. And films have told stories of Middle Earths and Hobbit kingdoms. You are part of a realm we now call, The Pacific. But somehow you are part of something else as well. It lives within the very fabric of your air, and hence within the fabric of your people. Amongst all else, it is a strength of heart and the never-ending ability to dare to weave new story into life, no matter what. A wondrous gift this is for the world to see and feel. Thank you for bringing it to our table. Kia Kaha, Aotearoa, Land of the Long White Cloud. Kia Kaha New Zealand. …I wrote this piece one week after the big earthquake hit Christchurch. As the week went on, I became deeply moved by the people there and New Zealand as a whole. At the time, I sent this to friends, but now that I have this blog, I wanted to share it with you. Christchurch still lives on shaky ground! I was travelling Down Under the past few months, mostly under the guise of dodging snowy winters, which I am not as fond of as I used to be. Not surprisingly I found myself back in Australia, sometimes fondly called, the land of OZ. OZ, that wonderful perhaps not-so-mythical region that as a storyteller I would adore to spend my life in, if only I could find my red ruby shoes! Australia itself is a place blessed by sun and wide open spaces. It’s big country. Not quite as large as my native Canada but close enough. And like Canada, it has many facets to it. I spent most of my time in Queensland, a vast state that is both warm and tropical; made more so if you reach the Far North, which I did not. I house sat frequently. It’s a wonderful way to get to know places and people, not to mention helping out with that shoestring of budget I usually surf the world on. I wandered from Brisbane to the Sunshine Coast and back, briefly venturing south to the NSW border and the Byron Bay Hinterland. I liked it all, a lot. I was also there for the floods, both the crescendo building of what I came to call, the rains, as they endlessly soaked lands, towns, and overflowing swimming pools to the eventual deluge of Brisbane city itself. It had horrific consequences. Crops were lost, lands were swamped, houses filled with silt and mud and water, and towns and cities ravaged, some beyond recognition. Yet in the midst of it all was the magnificent spirit of people, their willingness to pitch in and help each other, coupled with their desire to breathe deep and begin again. It was both heart-warming and inspiring. On top of that, I landed at the Auckland airport in New Zealand two hours after the large Christchurch earthquake. Again I saw massive destruction, buildings crumbled, people injured, some dying, some gone, and yet again the power of the human spirit in action, again that hand reaching forth and helping without question. Their resilience was profoundly moving. When I went back recently on route home to Canada, Christchurch experienced two more large aftershocks. It is impossible to imagine what it must feel like to never have a single moment when you are not sitting on shaky ground, literally, which is exactly what has been happening to the people of Christchurch. In the midst of this came Japan, with its massive earthquake, endless aftershocks, devastating tsunami, and nuclear disaster; a situation almost impossible to describe, let alone imagine having to live through. We are all left humbled by it. I have also seen what happens when the shock is over, when waters recede and what is left are mostly mud-filled streets, broken homes and buildings, liquefaction, or with the tsunami, perhaps nothing at all. The wave of fear that follows is understandable. The questions it brings, endless. What can be built again and how? With what and by whom? Our sense of security becomes profoundly affected, as do our beliefs. Often we are left with nothing to hold onto, our faith now dangling in the proverbial winds. And yet, strangely, it is in just such moments when a window often opens. Call it a gift of God, perhaps. A chance to view that silver lining, catch its hidden message, and dare to live anew. To me, we are at a cross-road. Do we continue to live life on the edge of an increasingly topsy-turvy world, being battered by the chaos that appears to be escalating, as though at times our even looking at it as it happens helps to build its momentum? Or do we dare to turn our view toward a brighter horizon, to feed our hearts and minds with the beauty and love that resides everywhere (yes, even midst the devastation), and then hold true to it with every breath we take and all the passion we can muster until it becomes our reality, balanced and harmonious? with a vividness of colour and light that has always been there but that we have been too clouded and too frightened to see. We will find ourselves opening to a love we have all craved for, the essence of which exists everywhere and is eternal. We live in paradise, here and now. paraphrasing), ‘I am the wind that blows over the sea, I am the wave, I am the sound, the earth, the plant, the sky, the ray of sun…’ In other words, I am my world and my world is me. I see it (as the movie, Avatar, would say) in all its beauty, and it sees me. every day. We can dare to dream a different world, and in so doing awaken to the fact that we are already living in it here and now. other, but we can succeed. After all, it’s our time, our window, the silver lining midst a cloud-filled world. One last thought – we bridge into each other’s worlds each and every day. Sometimes it’s through travel. Sometimes it’s a story told on television, in the newspapers, or online. Sometimes it is a visitor sitting at our table. When we bridge, we are touched, often deeply, and from that moment on we are never quite the same. We have become more. We have felt the magic or the plight of another. We have smiled or we have cried. We have remembered that we are all part of this family we call, humanity, and that at its core, our essence is eternal. When we remember that, we come home, we are more. This is our world. Let the bridge be one of love, the view be one of beauty, the invocation of a better life. Let us be willing to see paradise here and now. To celebrate its existence within our hearts and throughout our lives, and live it with joy and laughter, passion and harmony, and yes, with love.